We have a pedestal Crown Lynn plate but we aren't sure if it was originally produced this way or if someone in our family drilled a hole in the center of the plate and fit the silver pedestal to it. The pattern is a gilded floral with small nosegays of multi-coloured flowers. The mark is Crown Lynn New Zealand within a gold scroll. That pattern certainly has some age to it and the backstamp you describe was used from 1948 to 1955 according to Val Monk. 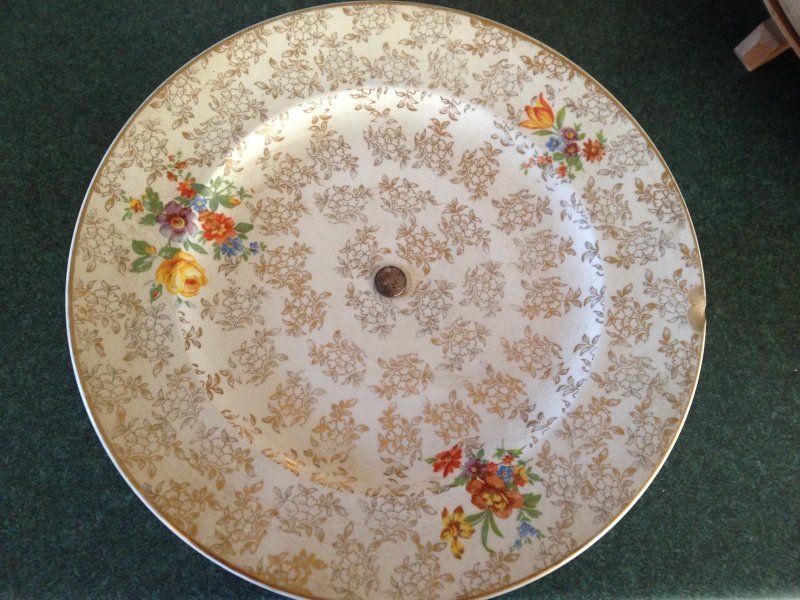 I have seen the odd old Crown Lynn plate on a stand but don't know if they were made like that or not. Hopefully someone out there will know. Thanks for the feedback - any ideas about the name of the pattern, about the stand or its value (it has a small chip which will make it less valuable) will be greatly appreciated. Glad to know its age - we knew it looked older than most Crown Lynn we see. Sorry Brent I have no idea of the value of your plate and stand. Yes the chip will reduce the value and I have never seen a pattern name for that pattern.